The day brought together about 450 children along with their parents and volunteers in celebrating the Rights of the Child and coincides with United Nations World Children’s day, which is observed around the globe on the 20th November. This date marks the day on which the Assembly adopted the Declaration of the Rights of the Child, in 1959, and the Convention on the rights of the child, in 1989. Held at the home of football in ‘Atele, the day kicked off with a parade lead by Tonga Defense Services military band with 20 communities displaying their messages on colourful banners in front of special guests, which includes the first secretary to the Australian High Commissioner in Tonga, Eliza, Punjas (Tonga) Ltd Manager, Sharmim, and TFA Executive member, ‘Alone Veatufunga. 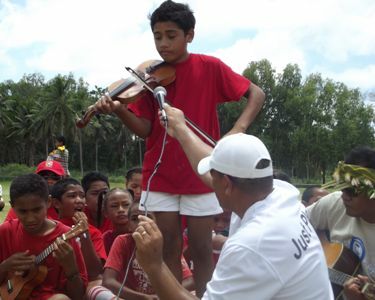 The Just Play day featured a wide range of fun activities for the children, including traditional dances, Ukelele kids band, caroling and small sided football games but the main attraction of the day was a talent show which was stolen away by 10 year old, Sione Mone, a left hand violinist from Kolomotu’a who thrilled the audience with his Violin skills. According to TFA’s Social Responsibility Officer, Pau Likiliki, the greatest achievement of the day is seeing children enjoying their day with families, which is what Just Play is all about. Prizes for best players ( boys and girls), youngest dedicated player, team of 2011, volunteers 2011, best uniform, best marching teams were also presented and were kindly donated by Punjas (Tonga) Ltd and Australian High Commission Office and TFA. As the festive season sets in, Just Play Tonga is kicking back due to school break, and waits the introduction of the National U12 “Meet up new friends” competition scheduled in two weeks time. 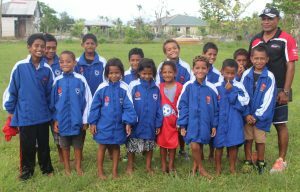 Oceania’s football family in the region also celebrated the day across the pacific.